This revealing ring features a calming blue gemstone that reflects shades of aqua blue while picking up white light from the two shimmering diamonds on either side. 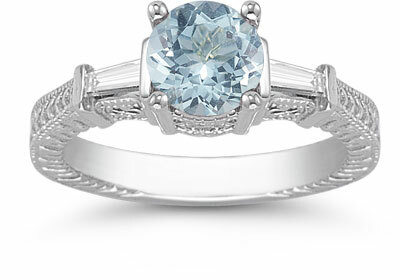 The Aquamarine and Baguette Diamond Engagement Ring in 14K White Gold is steeped in traditional design yet still becomes a contemporary choice because of its colorful center stone. The ring is cast in polished 14k white gold with a band that has several interesting components including top and side carvings and a raised setting to position the aquamarine stone in the best light. At the center of the ring is a round-cut aquamarine measuring 7mm with a radiating blue luster that perfectly matches the tone of the subdued white gold. 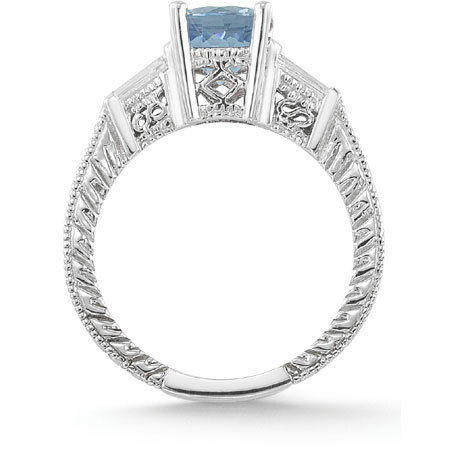 On each side of the aquamarine sit two parallel diamond baguettes (0.15 each) which reinforce the linear aspects of the ring, especially in the four posts for the stone settings as seen from the side. We guarantee our Aquamarine and Baguette Diamond Engagement Ring, 14K White Gold to be high quality, authentic jewelry, as described above.